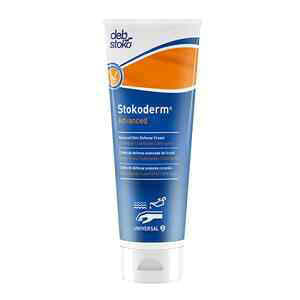 Catalog: Stokoderm® Advanced Cream 100 mL Tube. 12/Case. Silicone-free, this cream is designed for skin exposed to both water and oil-based, heavily contaminated substances, like carbon black, iron oxide, graphite, petrolatum, oil, and wax. As a pre-work cream, it has natural building agents to provide advanced protection in these situations. 100 mL Tube. 12/Case. NOTE: Not designed for use under gloves.